I have to be honest with you. Until I started planning my Los Cabos trip in late January and beginning of February, I had never heard of Todos Santos town. It was only then when I searched web for more places to visit close to Los Cabos and when I heard that the famous Hotel California from the Eagles’ song was located in the town. Add beautiful beaches in the area and I was sold. 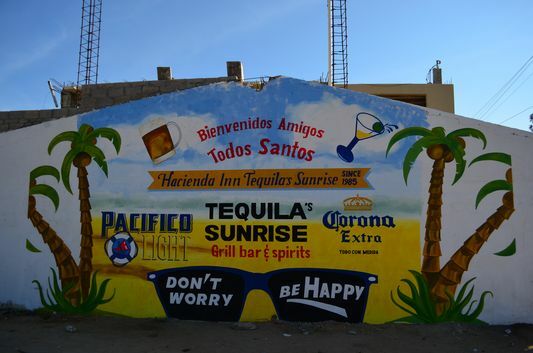 That was still all I knew about Todos Santos. Plus, there was an organic restaurant with fresh juices called Pura Vida that a couple mentioned to me when dining at Presto Italian restaurant just outside of Marina Fiesta Resort. I also heard from other tourists that Todos Santos town was pretty dead after 7 pm. But that was exactly what I needed to catch up with writing. Not much going on to have chilled out nights. After I checked in to Hotel California, Sergio from Todos Santos Eco Adventures waited for me to show me around. Like I said, I almost knew nothing about the town so had no expectations. But most of the time, that turns out to be the best experience. And it really was. Quickly I realized Todos Santos was a typical Mexican town like many of those I fell in love with back in 2011 during my first visit to Mexico. It was real Mexican and after the amazing all inclusive hotels in Los Cabos it was an unbelievable change. From touristy back to tradition. It was during our walk with Sergio when I completely forgot about my bad experience in Napa and again felt the heart beat in Mexico, my favorite country in the world. Todos Santos, one of the Pueblos Magicos of Mexico since 2006, really did use its charm to capture my heart. 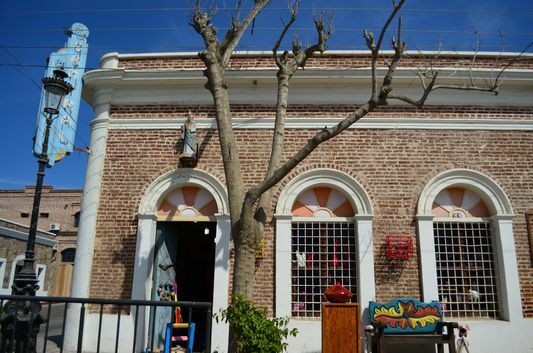 Art galleries, handcrafts, little restaurants and old style houses. 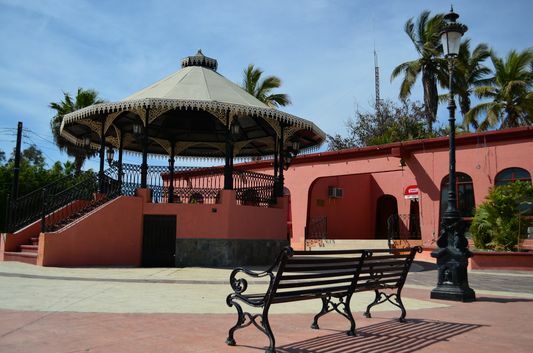 I was walking with Sergio until we got to Cultural Center, sat down under the huge tree shadow and went back in history until the 15th and 16th century where the history of Baja California began. We were in the Cultural Center to learn as much as we could. 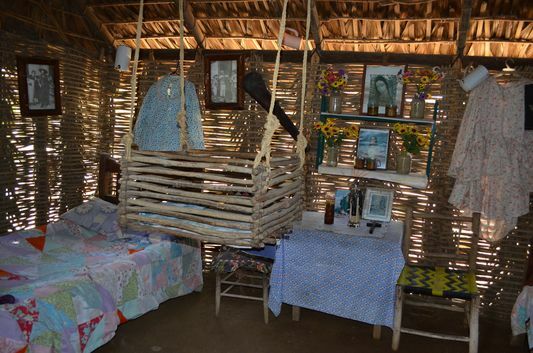 First we saw how a traditional Jesuit house made of leaves and wooden sticks looked like. It was actually always 2 buildings – one the bedroom with clothes, hats and photographs hanging out on the walls; the second one kitchen. Interesting to see how kitchen was separated in case it caught on fire so it would be the only one to burn, not the bedroom too. Still in the mountains it is possible to see people living the exact way like the Jesuits did. We also saw a painting here in the museum with the naked Native American women on it from Pericú tribe (there were another 2 main tribes in Baja California – Guaycuras and Cochimies). Sergio explained me how the men of Hernan Cortez thought they found the famous Amazon warriors here when they saw these women. And believe it or not, they were wearing some kind of skirts made of pearls as the Native Americans here didn’t know the value of pearls at that time, they just liked them so made skirts of them. In the museum, I also learned how Todos Santos town was founded. It was during the Gold Rush when the ships with people in search of gold were sailing around Baja California and as because of the water currents it took a month to just go around Baja California, they had to stop somewhere here for food. Thus, Todos Santos was built in 1733 when the ships started coming to Puerto Algodones I later explored during the cliff walk. Later on, 5 sugar mills were built in Todos Santos and the sugar cane was shipped to San Francisco area. I had no idea there was any sugar cane production in Baja California but just the sound of it reminded me my visit to St. Kitts and Nevis islands back in February that lived our of sugar cane for years. 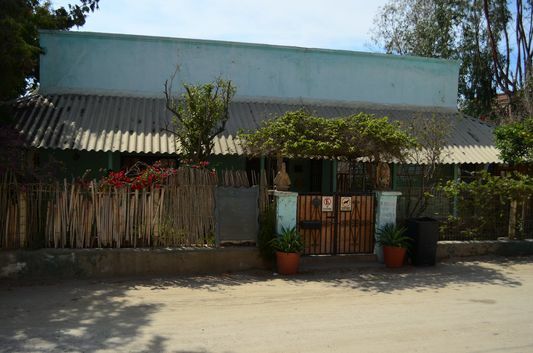 The museum also holds a collection of photos of people who visited Todos Santos, such as Eisenhower, famous Mexican people, and as well those living in the town, such as Chinese inhabitants (Mr. Wong). The Cultural Center is nowadays a school for rural teachers. Before we left, Sergio explained me the meaning of the three 1930’s murals on the entrance hall walls. 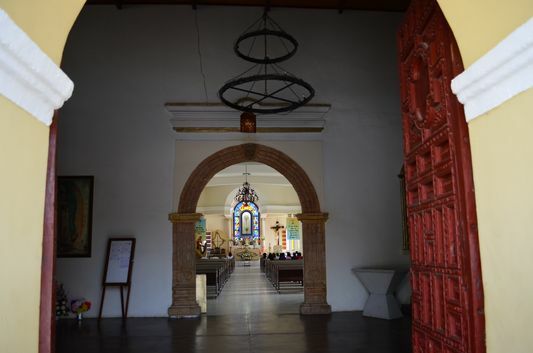 The first one (when you enter the building on the right) represents Baja California – happy faces of Franciscan priests and unhappy of Indians who were used as slaves to build the churches. A boat on the mural is drawn in such a way that it shows they wanted it to leave – make the Spaniards leave. Also the Mexican revolution heroes are on the right side of the mural. 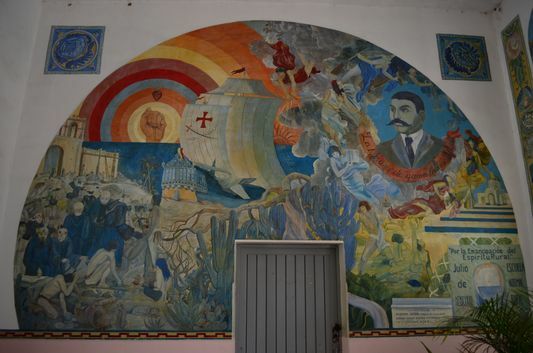 The Todos Santos mural in the middle just above the entrance door shows gold burning the hand and the last mural of this building shows the start of communism and national students of High School Olympics that took place here. After the Cultural Center visit Sergio took me through Obregon Street to Centenario Street explaining me why we could see some eucalyptus trees here. In 1955 they were brought here from Australia after they believed that the yellow fever could be cured with them (funny to see a completely different reason for the eucalyptus trees here comparing to why the eucalyptus tree were planted in California, such as Napa Valley or parts of San Francisco, e.g. on the way to Muir Woods). 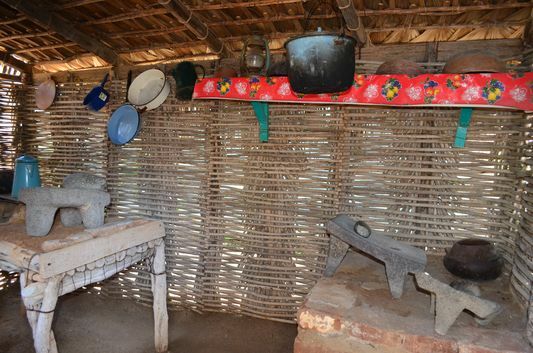 ”Back in time, what showed the wealth of a family was the floor in the house – the richest ones had wooden floor made of wood brought from British Columbia, Canada” Sergio pointed out on the ground. We were standing in front of a house that was half nicely white and blue painted and half not painted. Its two parts belong to two different owners now. The pained one, so called the Brooks house was bought by wealthy Brook family but then sold to another American who kept the name of the house situated at the corner of Obregon and Centenario streets. Back in time the house used to be a company store which was a very popular topic in that time – the sugar cane workers were paid with tickets and they could use them to interchange for food only in this company store and thus giving the money back to the owner. How smart! To be honest, most probably I would not walk here on my own if I didn’t know about the famous facts from history as the end of the street didn’t seem like anything special. But years ago Centenario used to be the main street of the town which led to La Paz. 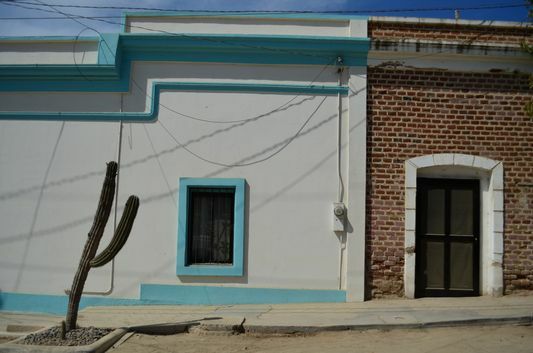 We walked more through Centenario street and I understood why Todos Santos was a Ghost town after the earthquake in 1950 when the rivers disappeared until 1975 when the water filled up the holes under ground and appeared on the surface again which brought people back to the area. It still looked so quiet and peaceful as if the time stopped here centuries ago! A Ghost Town yet so different to Mineral de Pozos, another Ghost Town I visited back in 2001. Just a few meters across the street from the Brooks house, the old cinema building stands (Centenario number 39). It has been redesigned as a residence. We walked up the street and passed the only house looking diametrically different to the others. It was built by a French who designed it with 3 entrances and 3 doors each. The house was then bought by Charles Stewart, an American painter and artist who founded Art Colony in Todos Santos. ”Quality of the light before sunset” Charles replied to Sergio’s question why he was painting here in Todos Santos and not anywhere else in the world. No humidity makes the light perfect to draw. 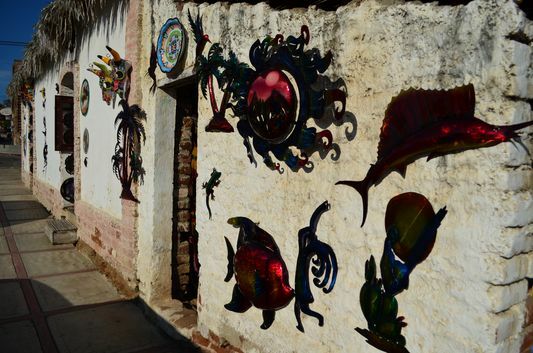 Todos Santos can be called an artist town with its 26 galleries now. 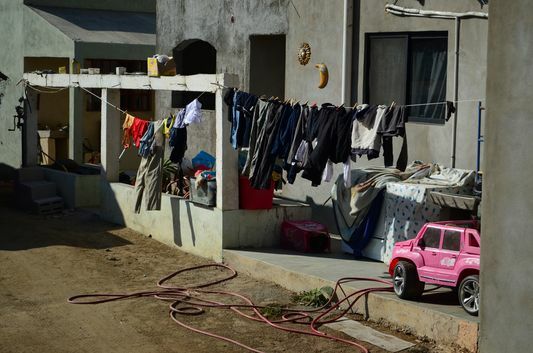 We passed Caffe Todos Santos which used to be the house of Mr. Wong – a Chinese who after migrating to Todos Santos married the daughter of the town’s richest man. This house was their wedding gift. As the first person in the town he came up with the idea to accept tickets from everyone, and thus became rich. The house were they lived is now transformed into Caffe Todos Santos offering great pastry, breakfast, coffee and free wifi. Just across the street we could see what is now called Casa Wong Central, another Wong’s old shop he built with the only neon sign in town (it doesn’t even work). It actually felt nice not to see any neon signs after my previous visit to Las Vegas. Now handcrafts are sold there since Wong left to La Paz and sold the house to one of the few Mexicans owning business in Todos Santos. A few meters walking and a typical Mexican square with a newly orange painted quiosco appeared on our right hand together with a white theater building. 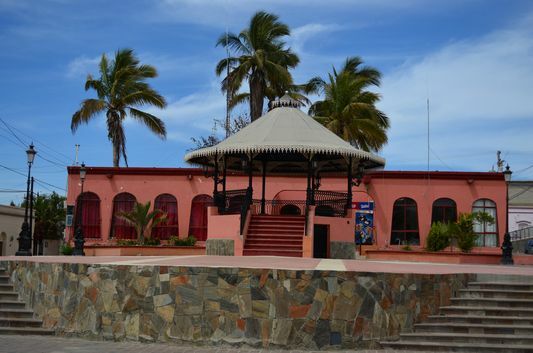 The theater was built thanks to Nestor Agundez Martinez, a teacher, director, artist, dancer and song writer who once made a dance for the Governor who liked it so much he promised to build a theater Nestor asked for. 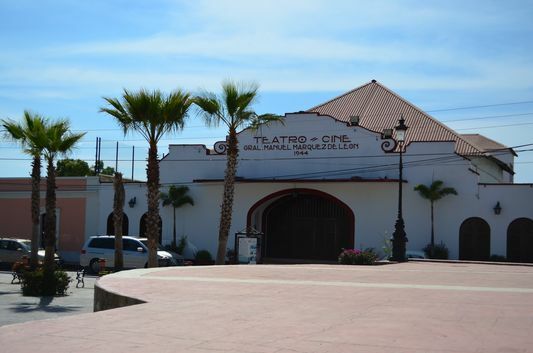 In 1944 the building was constructed with 300 seats which made it the only theater in Baja California for the next 50 years. The theater now holds the name of General Manuel Marquez de Leon. 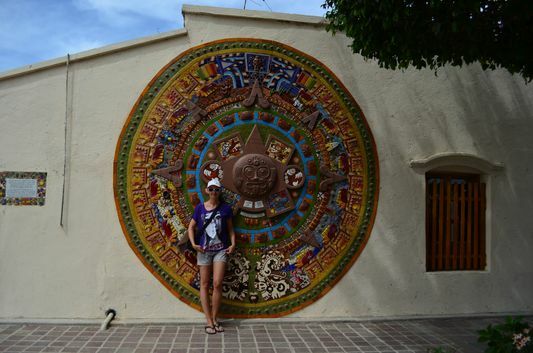 On the right side of the theater there is a massive colorful Aztec calendar worth a glimpse. No need to go to Mexico City to visit the National Museum of Anthropology and History to take photos with the world-known Piedra del Sol, there is one right here in Todos Santos! On the other side of the square the white building is housing the famous Santa Fe, an Italian restaurant with Californian fusion into it. It was once built by a Cuban guy called Santana. 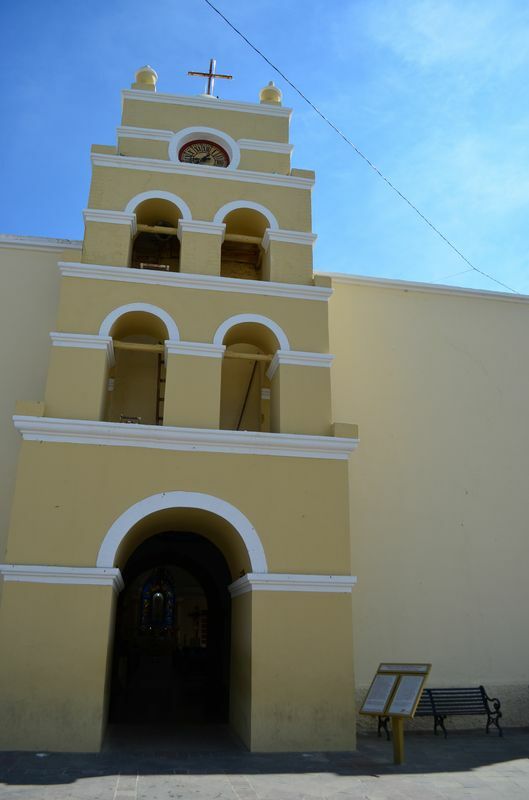 Standing in front of the square is the church Mision de Nuestra Señora del Pilar. Sergio gave me the story behind the fact of the missions being all different in each town – as the Jesuits were short on budget, they were asking different European rich people for help and then they let them decide on the design of the church bringing their roots into it depending on their country of origin. This church in Todos Santos was sponsored by a rich European woman and its thick walls with huge doors proved the church served as a fort too. The original one from 1733 was burnt and the one standing on its place nowadays was rebuilt by the Dominicans in the middle of the 19th century. ”Do you know why Todos Santos is called Todos Santos?” Sergio asked me with a smile. I shook my head. ”The mission was first inaugurated on All Saints day, 1st of November, hence the name of Todos Santos town.” Sergio finished our Todos Santos historical town tour. 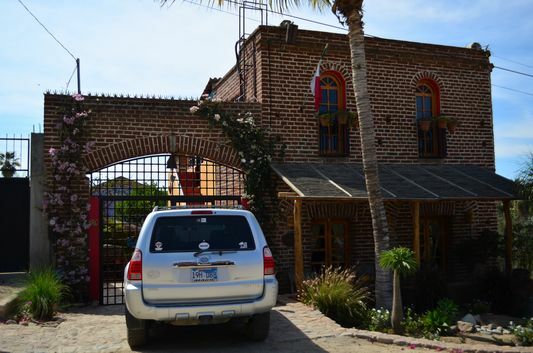 visit the famous Hotel California and get a meal in La Coronela or dinner at Santo Vino restaurant. I recommend to get breakfast or lunch in La Coronela to see its beautiful design during the day but then also dine here listening to live music. surfing – Todos Santos is becoming a surfers’ paradise. Not safe for swimming here though. PS: don’t forget to take a photo of Don’t worry, be happy sunglasses sign on the wall of the restaurant in front of Hotel California. And if you are looking for something to do in the nature just outside of Todos Santos, do the cliff walk, highly recommended! 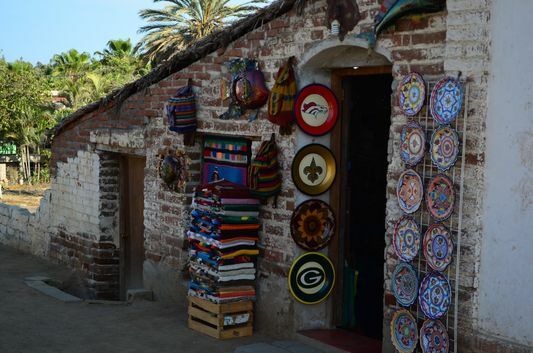 My Todos Santos historical town tour was a press tour done by Todos Santos Eco Adventures. The company donates a percentage of all town tours to the local fire department.